2017. By Hannah Kimberley. 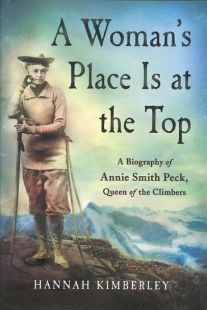 The new biography of Annie Smith Peak, the renowned turn-of-the-century mountain climber best known for his first ascents of the Mattterhorn and Peru's Mount Huascaran. This is the first full-length work about this incredible woman, who besides making a name for herself in climbing circles, also marched in suffrage parades and became a political speaker and writer before women had the right to vote in the United States. Hardcover. 348 pp.